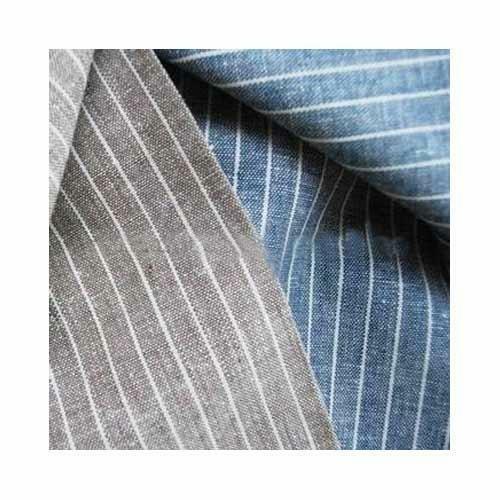 Keeping in mind the up-to-date market fashion trends and developments, we are offering a superbly stitched and high-class collection of Stripe Indian Linen Fabrics which are valued for their high tear strength and color fastness. In order to deliver a faultless consignment to our customers, we are offering these products in extraordinary grade packaging material. Moreover, we are altering as per the precise requirements of our customers. Incepted in the year 2007, Zed Aar Exports is recognized industry in the market, highly affianced in manufacturing, exporting, supplying and trading an extensive array of Fashionable Scarves, Infinity Scarves, Summer Scarves, Printed Scarves, Wool Scarves, Natural Cotton Scarves, Linen Scarves, Pashmina Scarves, Digital Print Scarves, Block Print Scarves, Tie Dye Scarves, Linen Fabrics, Beachwear Sarongs, Handmade Silk Bags, Rayon Viscose Scarves, Square Scarves, Raw Silk Fabrics, Cushion Covers and Recycled Silk Yarns. These offered products are highly acclaimed among our customers for their color fastness and attractive designs. Our provided range is manufactured and designed in compliance with industry set norms by using top notch quality fabrics and cutting edge technology. These offered products are stringently examined and tested by our quality analyzers on various parameters to make sure their flawlessness and high performance. Along with this, these products are available in the market at very rock bottom prices within stipulated time frame.